The suggestion of a few bumps during today’s racing will seem like mountains in comparison to the other sprinters’ stages on offer this week, stretching uninterrupted for miles on flat tarmac roads through the desert landscape. 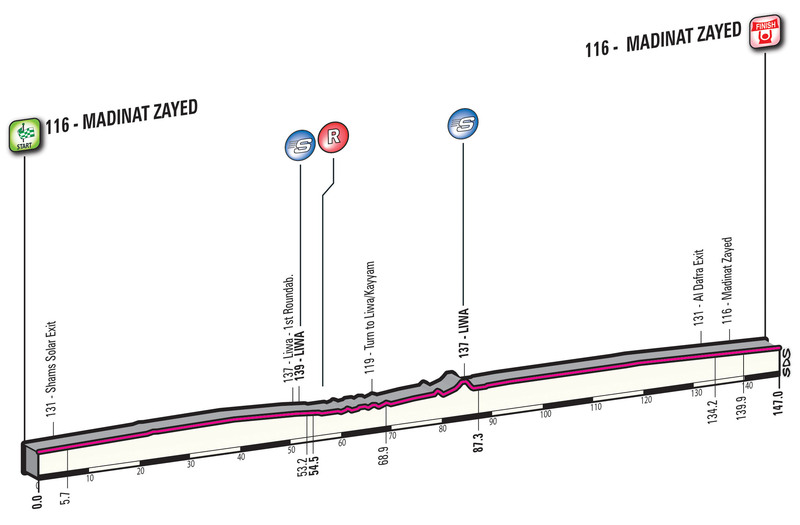 Stage 1 is an 147km out and back trip from Madina Zayed, taking in a few meters of climbing as they roll over dune styled hills, ultimately spending the most part of the day on featureless terrain. A smattering of turns appear in anticipation of the finish line, though the last kilometre itself is a wide finishing straight which should favour those who often dominate a drag race to the finish. Mark Cavendish will wish to return to winning ways after having to settle for silver in Doha last weekend and is no doubt highly motivated to do so. The British sprinter does not possess his full arsenal of team support for the sprints, but a combo of Mark Renshaw and Bernhard Eisel has seen him through plenty of days in the saddle safely enough en route to victory. André Greipel was initially seen as a favourite for the world title in Qatar, but the potent tactics of the Belgian teams meant the desert wind cut him from the lead group and immediately ended his hopes of a medal. Greipel’s leadout train is far from the familiar wheels he normally follows in the final kilometres of racing, but the simple finishing straight should prove perfect territory for him to hammer out the watts. John Degenkolb had initially made it across to the front echelon in Doha after the race was blown to pieces, yet suffered a mechanical and ultimately drifted back to endure Germany’s failings with his teammates. He arrives in Abu Dhabi with Koen De Kort and Ramon Sinkeldam to set him up in the sprints, eager to rectify his dose of misfortune at the world championships by picking up a stage win. Giacomo Nizzolo performed better than expected in pursuit of the rainbow bands last weekend and looks to be in great form as the season reaches its end. The Italian may struggle with the lack of technical finishes at this race, so will need to deliver his sprint perfectly if he is to challenge the likes of Cavendish and Greipel. Elia Viviani picked up two wins here last year, bringing with him fast finishers Owain Doull and Danny Van Poppel on this occasion in hope of repeating his success. Much of 2016 has been spent focusing on track racing ahead of the Olympics, resulting in a gold medal, so there is uncertainty as to his road form right now. Magnus Cort Nielsen announced himself to the pro ranks by snatching two stage wins in the final week of this year’s Vuelta a España. He will however be sharing duties with Michael Matthews in Abu Dhabi and there is a reasonable chance they shall look to support the Australian instead today. Other riders hoping to feature in the mix for the win are Sacha Modolo, Andrea Guardini, Jean-Pierre Drucker and Steele Von Hoff. Posted on October 19, 2016 by Spokenforks	This entry was posted in News and tagged 2016, Abu Dhabi Tour, Abu Dhabi Tour Stage 1 Preview, Andre Greipel, Andrea Guardini, Elia Viviani, Giacomo Nizzolo, Jean-Pierre Drucker, John Degenkolb, Magnus Cort Nielsen, Mark Cavendish, Michael Matthews, Sacha Modolo, Steele Von Hoff. Bookmark the permalink.